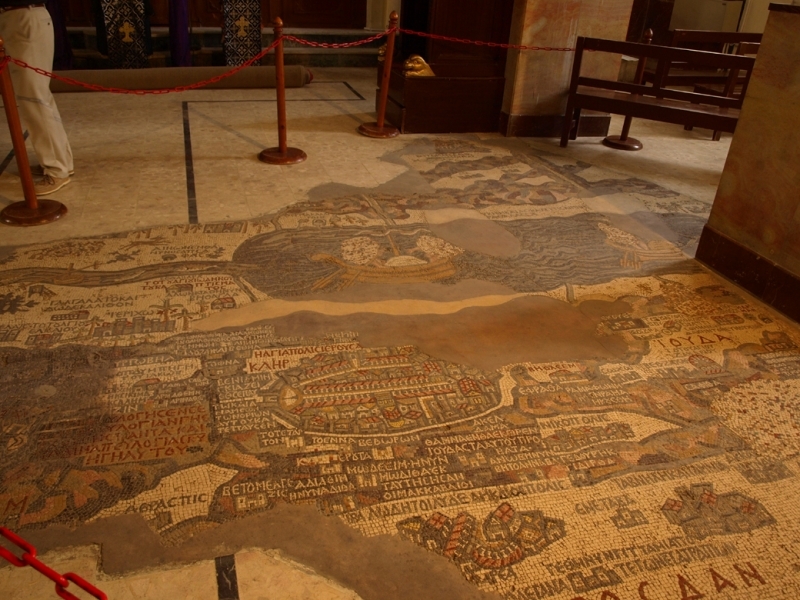 The Map of Madaba mosaic was discovered in 1896, it's a map of the region dating from the 6th century and preserved in the floor of the Greek Orthodox Basilica of Saint George Church, it know also as the "Church of the Map". With two million pieces of colored stone, the map depicts hills and valleys, villages and towns in Palestine and the Nile Delta. 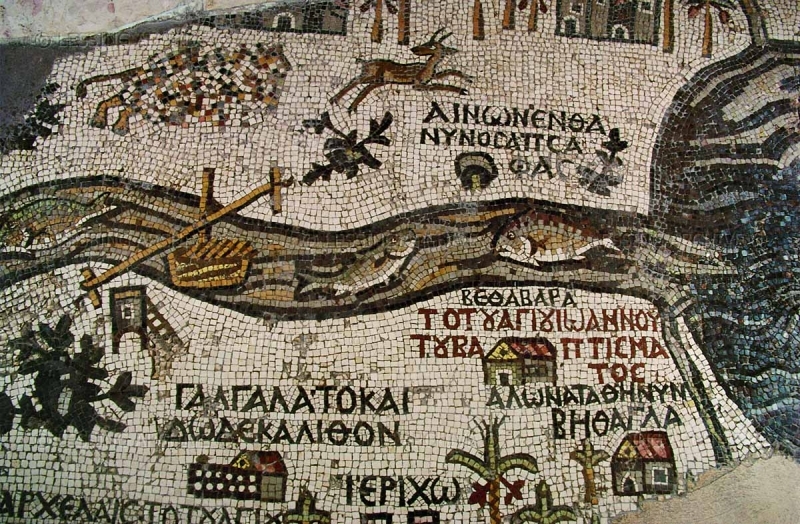 The mosaic contains the earliest extant representation of Byzantine Jerusalem, labeled the "Holy City." The map provides important details about its 6th-century landmarks, with the cardo, or central colonnaded street, and the church of the Holy Sepulchre clearly visible. This map is one key in developing scholarly knowledge about the physical layout of Jerusalem after its destruction and rebuilding in 70 AD. Other mosaic masterpieces found in the Church of the Virgin and the Apostles and the Archaeological Museum, depict a profusion of flowers and plants, birds and fish, animals and exotic beasts, as well as scenes from mythology and everyday pursuits of hunting, fishing and farming. 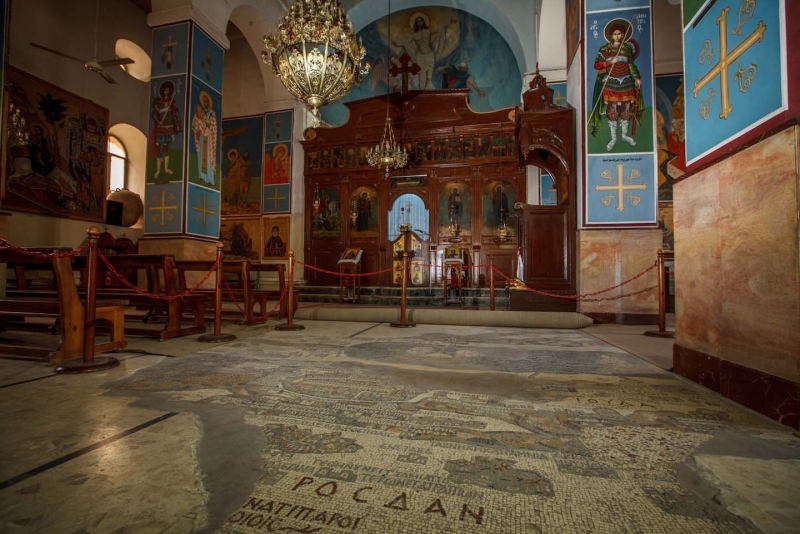 Hundreds of other mosaics from the 5th through the 7th centuries are scattered throughout Madaba.